The two day fall meeting of the Chronic Fatigue Syndrome Advisory Committee (CFSAC) took place on Tuesday, November 8 and Wednesday, November 9, 2011 at a new venue – the Holiday Inn Capitol, Columbia Room, 550 C Street, SW, Washington, DC. In May 2009, a precedent was set for the entire proceedings of CFSAC meetings to be streamed as real-time video with videocasts and auto subtitling posted online a few days after the meetings have closed. Prior to the November meeting, CFSAC Committee Support Team had clarified that the commitment to providing real-time video streaming could not be met (later said to be due to budgetary constraints) and that a phone link would be provided instead – an option not available to those of us outside the US – and that a high quality video of the two day proceedings would be posted within a week. In the event, videos for Day One and Day Two of the meeting were not posted within this timeframe. The Agenda items that have the most relevance for Dx Revision Watch site are the presentation on Day One by Donna Pickett (NCHS) and the Committee’s formulation on Day Two of a revised CFSAC Recommendation to HHS on the coding of CFS in the forthcoming ICD-10-CM. The video for that section of the meeting wasn’t published on YouTube until November 17, just one day prior to the closing date for submission of comments on the proposals for the coding of CFS in ICD-10-CM put forward by the Coalition4ME/CFS for NCHS consideration and an alternative option presented by NCHS at the September 14, 2011 meeting of the ICD-9-CM Coordination and Maintenance Committee . This meant that many of those compiling comment for submission before the November 18 deadline who had not attended the CFSAC meeting in person were unable to use Ms Pickett’s presentation to inform their submissions as they were not aware that the videos for Day One had been published or would have already submitted their comments. During her presentation, Ms Pickett had outlined the two proposals under consideration (Option 1 and Option 2) but the slide for the NCHS’s suggestion (Option 2) omits the suggested Excludes. 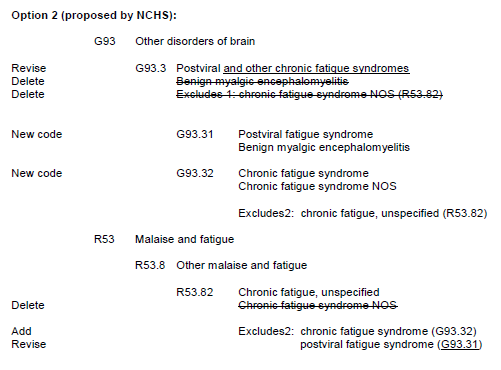 Note also that the presentation slides did not set out that NCHS has suggested the inclusion term “Chronic fatigue syndrome NOS” under a suggested subcode, “G93.32 Chronic fatigue syndrome”. • the specification of class 2 exclusions, that is, “Excludes2” rather than “Excludes1”. If consideration were being given to the creation of separate subcodes or child categories to a revised parent G93.3 class, then I would prefer to see three discrete subcodes under G93.3, one for each term, in the order: G93.31 Postviral fatigue syndrome; G93.32 Myalgic encephalomyelitis (Benign); G93.33 Chronic fatigue syndrome under an alternative term to the suggested parent term, “G93.3 Postviral and other chronic fatigue syndromes”. I have reviewed the September ICD-9-CM Coordination and Maintenance Committee meeting audio  and do not consider there had been adequate discussion at the meeting of the implications for the inclusion of a “Chronic fatigue syndrome NOS (Not Otherwise Specified)” coded to a suggested subcode “G93.32 Chronic fatigue syndrome”. The implications for this suggestion do not appear to have been discussed publicly at the November CFSAC meeting nor were the potential implications for the use of “Excludes2” class excludes raised during public discussion. CFSAC rejects current proposals to code CFS in Chapter 18 of ICD-10-CM under R53.82: Chronic fatigue, unspecified > Chronic fatigue syndrome NOS. CFSAC continues to recommend that CFS should be classified in ICD-10-CM in Chapter 6 under “diseases of the nervous system” at G93.3, in line with ICD-10 and ICD-10-CA (the Canadian Clinical Modification), and in accordance with the Committee’s recommendations of August 2005. Following committee discussions at the November meeting, this May 2011 Recommendation was reviewed and expanded on to reflect the developments at the September 14 meeting of the ICD-9-CM Coordination and Maintenance Committee and CFSAC committee’s views on the two Options that have been proposed and are under consideration. CFSAC considers CFS to be a multi-system disease and rejects any proposal to classify CFS as a psychiatric condition in the US disease classification systems. CFSAC rejects the current classification of CFS in Chapter 18 of ICD-10-CM under R53.82 – chronic fatigue, unspecified > chronic fatigue syndrome Not Otherwise Specified. CFSAC continues to recommend that CFS should be classified in ICD-10-CM in Chapter 6 under “Diseases of the nervous system” at G93.3, in line with ICD-10 (the World Health Organization) and ICD-10-CA (the Canadian Clinical Modification), and in accordance with the Committee’s recommendations of August 2005 and May 2011. CFSAC rejects the National Center for Health Statistics Option 2 and recommends that CFS remain in the same code and the same subcode as [benign] myalgic encephalomyelitis because CFS includes both viral and non-viral triggers. CFSAC recommends that an “Excludes1” be added to G93.3 for chronic fatigue – R53.82 and neurasthenia – F48.0. 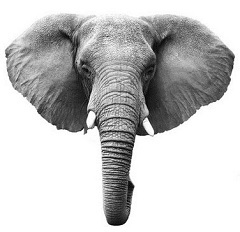 * CFSAC recommends that these changes be made in ICD-10-CM prior to its roll out in 2013. *Ed: Note: CFSAC committee has been advised that the discrete code for Neurasthenia in ICD-10-CM Chapter 5 is F48.8 not F48.0, as had been read out at the meeting. I am informed that the new Recommendation is being amended. During her presentation to CFSAC, in response to a query from the floor, Ms Pickett had clarified that the comments being received by NCHS were not being reviewed until after the closing date for submissions (November 18) and that a decision about the proposals would be made in December. At the time of publication, no decision has been made public and it is not known whether any decision has been arrived at. On December 18, I emailed Ms Pickett and asked if she could advise me by what date a decision is expected to have been made following review and consideration of the comments on proposals for the coding and chapter placement of Chronic fatigue syndrome for ICD-10-CM that were received by her office between September 14 and November 18. I also asked Ms Pickett if she would clarify if this meant that any decision arrived at by the Coordination and Maintenance Committee is advisory only and whether a final decision would be made by the Director of NCHS and Administrator of CMS; if this is the case, by what date would their decision expect to be made and by what means would a decision be made public. I will update when I have a response from Ms Pickett and/or when any decision has been reached and announced. See this CFSAC page for PDFs of Written Testimony Received Prior to the Meeting Date. The Coalition4ME/CFS had submitted a proposal to NCHS, prior to the September meeting, requesting that Chronic fatigue syndrome be deleted as an inclusion term under code R53.82 Other malaise and fatigue (Chapter 18 Symptoms, signs and abnormal clinical and laboratory findings, not elsewhere classified) and that the term be added as an inclusion term under code G93.3 Postviral fatigue syndrome (Chapter 6 Disorders of the nervous system). 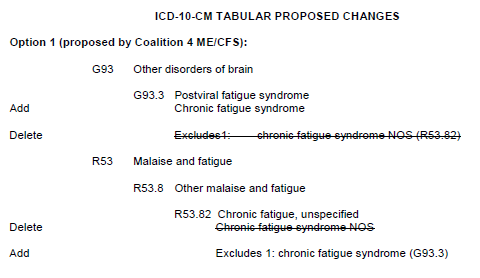 The Coalition 4 ME/CFS had also requested that their proposal be considered for October 1, 2012 so that the change occurs prior to the October 1, 2013 implementation date of ICD-10-CM even though the condition is not a new disease. Ed: Note: Option 1 (Proposal by the Coalition4ME/CFS) does not display the term Benign myalgic encephalomyelitis under G93.3 Postviral fatigue syndrome. This is because no change to the placement of this term was being requested by the Coalition4ME/CFS, that is, there was no proposal to Add, Delete or Revise the term Benign myalgic encephalomyelitis other than a request that consideration be given to placing the ICD-10 descriptor “Benign” at the end of the term, as “Myalgic encephalomyelitis (Benign)”. The ICD-10-CM has two types of excludes notes. Each note has a different definition for use but they are both similar in that they indicate that codes excluded from each other are independent of each other. A type 1 Excludes note is a pure excludes. It means “NOT CODED HERE!” An Excludes1 note indicates that the code excluded should never be used at the same time as the code above the Excludes1 note. An Excludes1 is for used for when two conditions cannot occur together, such as a congenital form versus an acquired form of the same condition. A type 2 excludes note represents “Not included here”. An excludes2 note indicates that the condition excluded is not part of the condition it is excluded from but a patient may have both conditions at the same time. When an Excludes2 note appears under a code it is acceptable to use both the code and the excluded code together. The information in this mailing relates only to ICD-11, the forthcoming revision of ICD-10 that is scheduled for completion and pilot implementation in 2014/15. It does not apply to the forthcoming US specific Clinical Modification of ICD-10, known as ICD-10-CM, or to other Clinical Modifications of ICD-10, already in use. Revision of the WHO’s ICD-10, the version of ICD in current use in the UK and over 110 countries worldwide, has been underway since 2007. The implementation date has already been shifted from 2012 to 2014/15. A Beta Draft platform for ICD-11 had been scheduled for readiness by April, this year, for public release in May. But ICD Revision is evidently struggling to keep this project on track. In October, last year, the Revision Steering Group’s “iCamp2” meeting acknowledged that a considerable amount of work needed to be done if ICD Revision if targets for a May 2011 release of a Beta Draft platform were going to be met. According to an October iCamp2 PowerPoint presentation, Frequent Criticisms, and iCamp2 meeting videos, targets for the population of content for the Alpha Draft had not been reached: less than 80% of the Terminology Definitions had been uploaded to the iCAT and less than the 20% target for full Content Model completion for the thousands of diseases and disorders classified within ICD had been met. The Revision Steering Group (RSG) identified a number of barriers to keeping this very technically ambitious project on track: lack of funding; the amount of time required for drafting definitions and population of textual content according to the complex ICD-11 “Content Model”; recruitment of external experts for reviewing proposals and generating content; familiarising the various Topic Advisory Group (TAG) members with informatics and the functionality of the iCAT (the collaborative authoring platform through which ICD-11 is being drafted); the paucity of face-to-face meetings for TAG managing editors and workgroup members, (scattered across the globe and undertaking these roles, by electronic means, in addition to their professional commitments), and difficulties facilitating interaction between the various Topic Advisory Groups where diseases overlap with other chapters. 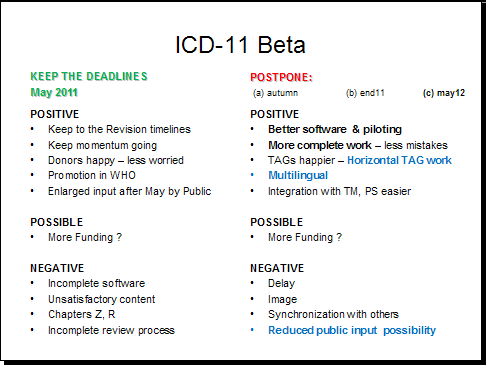 If ICD Revision is already struggling to maintain targets, motivation and interaction between its various Topic Advisory Groups, then management of the project once the Beta drafting phase is reached and the process opened up to [the projected] thousands of stakeholders is going to present ICD-11 RSG and TAG managing editors with considerable challenges. The ICD-11 iCamp YouTube commentaries have an air of brittle optimism about them. I have already predicted that come May 2011, we might anticipate some scaling back of plans and/or a possible shift in the release date for the Beta drafting platform (and potentially a further shift in the final ICD-11 implementation date) in response to recognition that the WHO may have significantly overestimated its capacity for obtaining funding and resources to fulfil this most ambitious vision by 2014.
or open here on Dx Revision Watch site. This document is the Report of a WHO-FIC Council conference call which took place between 14:00-15:30 Geneva Time, on Wednesday, February 16, 2011. It confirms that ICD Revision is debating whether to go public in May with a Beta drafting platform that falls short of targets for completion or whether to revise its schedule. “In the context of the review of preparations for the ICD-11 Beta release, there was a set of arguments for and against a postponement of the beta release. “The status was summarized as in the slide below. • It is essential to have a good product that goes out to the general public. • Extra time is needed for the cross-cutting TAGs as most substantive review is starting lately. • On the other hand, having no public input into the process is of concern. “Wider input is necessary; and public and transparency input was a goal of the revision process. A hybrid model of opening the revision process to public comment and suggestions at the same time not a full scale beta phase with field trials may be a better solution. I will update if and when ICD Revision issues an information release on its decision about the Beta Drafting platform and clarifies its intentions for the extent of public participation, or when more information becomes available. In November, the iCAT electronic authoring platform through which the Alpha Draft was being developed was taken out of the public domain. The server for the improved version of the iCAT, which provides the platform for drafting the Beta is sitting behind a password, here: http://icat.stanford.edu/. Access and editing rights are currently restricted to WHO, Revision Steering Group, the various ICD-11 Topic Advisory Group managing editors and members, reviewers of content and proposals and IT technicians. But it was envisaged that at the Beta stage, the drafting platform would be opened up for public access and to interested stakeholders who register for limited imput. The Alpha and Beta drafts are “works in progress”. Proposals as they stood in the iCAT collaborative drafting platform in November, last year, are that all three terms, PVFS, (B)ME and Chronic fatigue syndrome should be classified within ICD-11 Chapter 6: Diseases of the nervous system . A meeting was expected to be held in Geneva, this week, and I will post further information as it becomes available on the ICD Revision Google site. The information in this post relates only to the development of ICD-11. It does not relate to the development of the forthcoming US specific “Clinical Modification” of ICD-10, known as “ICD-10-CM”. A WHO ICD Revision meeting was held in Ankara, Turkey, at the end of February. The ICD Revision Paediatrics Topic Advisory Group (TAG) met to discuss “Diagnostic issues on Children and Youth”. A number of meeting documents and videos have been posted on the ICD Revision site which are general background documents to the ICD-11 development process and not specific to the work of TAG Paediatrics or the focus of the Ankara meeting. The two training videos (“ICD-11 Content Model Training” and “iCAT Training”) are now also available on YouTube. The training videos are aimed at those currently involved with the ICD-11 Revision process as WHO staff, IT technicians and the chairs, managing editors, members and external reviewers of the ICD-11 Topic Advisory Groups but will be of general interest to those following the development of ICD-11. One of the main differences between ICD-10 and ICD-11 will be the amount of textual content associated with ICD categories. In ICD-10, there is no textual content, definitions or descriptions for any of the three terms, PVFS, ME, CFS, and the relationship between these terms is not specified within ICD-10. But the ICD-11 Content Model contains 13 parameters that may be used to describe ICD entities and these parameters are discussed in the training video. So if you are not familiar with the extent of the potential for textual content describing categories within ICD-11, this video sets this out. In the References is the URL for the latest version of the “Content Model Reference Guide” document. 1. ICD Entity Title; 2. Classification Properties; 3. Textual Definition(s); 4. Terms; 5. Body Structure Description; 6. Temporal Properties; 7. Severity Properties; 8. Manifestation Properties; 9. Causal Properties; 10. Functioning Properties; 11. Specific Condition Properties; 12. Treatment Properties; 13. Diagnostic Criteria. The second video describes the operation of the iCAT collaborative drafting platform through which the alpha and beta drafts are being developed. The platform is currently behind a password and accessible only to ICD Revision personnel who have editing rights, but it is understood that after the Beta Drafting stage has been reached, the iCAT should be accessible to stakeholders for limited input. The International Classification of Diseases (ICD) is a public global standard that organizes and classifes information about diseases and related health problems . Health offcials use ICD in all United Nations member countries to compile basic health statistics, to monitor health-related spending, and to inform policy makers. In the United States, use of the ICD is also a requirement for all medical billing. ICD has therefore a major impact on many aspects of health care all over the world. In 2007, the WHO initiated the 11th revision of ICD. Several ambitious goals were set for this version (details in ). One such goal is to allow the ICD to become a multi-purpose classification for a much larger number of usages. Previous versions of ICD were strictly classification hierarchies used for statistical purposes. To meet the new revision goals, ICD-11 will use OWL to create a rich formal representation. Another key diference between ICD-11 and previous versions is that the development process of ICD-11 will use a Web-based open process powered by collaboration and social features. That is, similar to Wikipedia, the WHO hopes that a large number of medical experts will contribute to the content of ICD-11. The iCamp2 meeting, scheduled for April but postponed due to volcanic ash cloud disruption of air traffic, was held between 27 September – 1 October, in Geneva. The revised Agenda for the meeting can be read here in html on the ICD Revision site. Download here as a Word document from the ICD Revision site or open here iCamp2 Agenda September 2010 on DSM-5 and ICD-11 Watch site. I will post a link for the minutes, summary or note of this meeting when these are available on the ICD Revision site. The information in this update relates only to proposals for ICD-11. This information does not apply to ICD-10-CM, the forthcoming “Clinical Modification” of ICD-10, which is scheduled for implementation in October 2013 and is specific to the US. Post #45 is intended to clarify any confusion between ICD-10, ICD-11 and the forthcoming US specific “Clinical Modification”, ICD-10-CM. 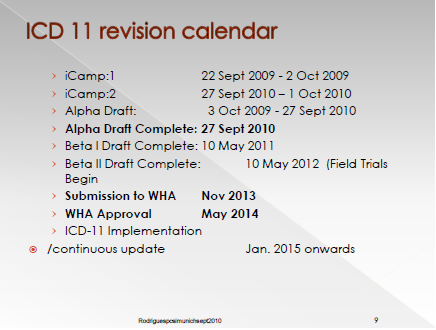 In his iCamp2 Introductory presentation, Dr Bedirhan Üstün says there are just seven months to go before the start of the ICD-11 beta drafting phase and 43 months to the final version. Beta drafting remains scheduled to begin in May 2011, even though targets for the drafting of content are slipping and an Alpha Draft has yet to be published. iCamp2 acknowledged that a considerable amount of work needs to be done in the interim if ICD Revision is going to meet its targets. A press launch for the Alpha Draft had been tabled for discussion on the Agenda for the April iCamp2 meeting. In the event, the April meeting was postponed, but ICD Revision has issued no public explanation for why the anticipated Alpha Draft failed to be released in April/May, nor has the Steering Group issued a revised ETA. The Alpha draft will be produced in a traditional print and electronic format. The Alpha Draft will also include a Volume 2 containing the traditional sections and including a section about the new features of ICD-11 in line with the style guide. An index for print will be available in format of sample pages. A fully searchable electronic index using some of the ontological features will demonstrate the power of the new ICD. According to sources, in July, a print version of the Alpha Draft was expected to be made available around the time that the rescheduled iCamp2 meeting took place in September. Requests for clarification of the status and accessibility of an alpha draft have been left on ICD Revision Facebook site by several members of the public. When a response was eventually forthcoming, in August, it was confirmed that a “draft print version will be available in September 2010”. iCamp2 is over now, but it remains unclear whether a print version has been produced, whether it is intended for internal use only or is going to be made available for public scrutiny, and if so, when, and in what format(s). ICD Revision has been asked to clarify. Source: Slide 9, PDF presentation slides: ICD-11 Revision: where are we now? Ontology driven tools and web platform. JM Rodrigues et al, DSPIM, University of Saint Etienne, WHO Collaborating Centre for International Classifications in French Language, Paris. The Revision Steering Group (RSG) has launched a number of public interfaces – the ICD-11 Revision site (meeting agendas, minutes, documents and presentations), a YouTube channel, a blog (not updated since October 2009), a Facebook site, Twitter and an iCAT users Google Group, open to any stakeholders who register for access. The iCAT Web 2.0 drafting platform is also viewable by the public and the production server can be accessed here: http://icat.stanford.edu/. But little consideration appears to have been given to who should take responsibility for responding to questions from stakeholders or fielding queries left on the ICD Revision Facebook site, which rarely receive a reasonably prompt response, or any response, at all. WHO Secretariat do not always acknowledge or respond to enquiries. A request for clarifications from a Topic Advisory Group (TAG) Chair, whilst acknowledged, has received no response after three months. The 5th meeting of the International Advisory Group for the Revision of ICD-10 Mental and Behavioural Disorders (currently ICD-10 Chapter V) was held on 28 – 29 September 2009. A year later, a Summary Report is still pending publication and no meeting summaries for TAG Mental Health have been published on the WHO website since the 4th Meeting 1 – 2 December 2008. The WHO needs to decide whether, in launching public interfaces and using “social networking” for input and feedback from stakeholders it genuinely seeks to provide platforms for meaningful interaction with the public or whether these are tokenistic nods at “transparency”. Content posted by ICD Revision admin on its Facebook Wall often lacks meaning and substance. What stakeholders really need to know is whether any form of alpha draft is going to be publicly released before the Beta phase – not photos of happy iCampers playing bassoons at musical soirées and iCamp bonding sessions. I will update if and when any information is released on the status and public availability of an alpha draft, and what format(s) it will be available in. Since 2007, it has been possible for stakeholders in the development of ICD to submit proposals and comments, supported by citations, via the ICD Update and Revision Platform Intranet. It was understood, last September, that for some Topic Advisory Groups (notably Chapters 5 and 6) a proposal form for ICD-11 was being prepared for use by stakeholders. Information about the availability of proposal forms for the various Topic Advisory Groups, up to what stage in the development process timeline these might be used and which stakeholders might be permitted to make use of any proposal forms already being issued or in preparation would also be welcomed from the Revision Steering Group or TAG managing editors. According to the iCamp2 PowerPoint presentation, Frequent Criticisms and this iCamp2 YouTube, targets for the population of content for the Alpha Draft have not been reached. Less that 80% of Terminology Definitions have been uploaded to the iCAT and less than the 20% target for full Content Model completion for the many thousands of diseases and disorders classified within ICD has been met. [The Content Model identifies the basic properties needed to define any ICD concept (unit, entity or category) through the use of multiple parameters.] Not all parameters of the Content Model are implemented yet. Not all Topic Advisory Groups are at a similar developmental stage; Beta Plans are behind schedule. The Revision Steering Group identifies barriers to keeping this technically very ambitious project on track: lack of finances; the sheer amount of time required for the drafting of definitions and population of textual content according to the complex ICD-11 Content Model; recruiting external experts for reviewing proposals and generating content; familiarising TAG workgroup members with the functionality of the iCAT, the collaborative authoring platform through which ICD-11 is being drafted, and with informatics; entering data into the iCAT; the paucity of face-to-face meetings for TAG managing editors and workgroup members who are scattered across the globe and undertaking these roles in addition to professional commitments; difficulties facilitating interaction between the various Topic Advisory Groups where diseases overlap with other chapters. A number of new workgroups have recently been created (Paediatrics, Dentistry, E.N.T, Traditional Medicine and Communicable/Tropical Diseases). The knowledge representation space is too large to be curated by a small number of experts (e.g. 20,000 ICD Categories, 15 parameters of CM [Content Model], each may have 1-20 entries – on average a relational database matrix with 300,000 entries). Scaling up the process from the alpha phase to beta should be carefully planned and modelled. It is estimated that the alpha phase participants will be at the magnitude of 500-1000 persons. In beta phase it is expected to have 10-100 fold increase. If the Revision Steering Group is already struggling to maintain motivation and interaction between the various Topic Advisory Groups, then management of the project once the beta phase is reached and the process opened up to stakeholders is going to present the Steering Group and TAG workgroup managing editors with considerable challenges. The original dissemination date for ICD-11 had been 2012, with the timelines for the revision of ICD-10 and DSM-IV running more or less in parallel. The dissemination date for ICD-11 was later extended to 2014 and the publication date of the next edition of the DSM, DSM-5, extended to May 2013. The development of ICD-11 is a hugely complex and technically ambitious undertaking; all three volumes will be electronically published, integrable and intended to be integrable with some other health classification publications; the scope of ICD-11 is far greater than that of the previous edition. It may be that come May 2011, we might anticipate some scaling back of plans and/or possibly a shift in the release of the Beta Draft from May 2012 to 2013+, in response to the recognition that the WHO may have significantly overestimated its capacity for securing the funding and resources to complete the technical work on this project by 2012, if implementation of the final version is to take place in 2014. The iCamp YouTube commentaries have an air of brittle optimism about them. 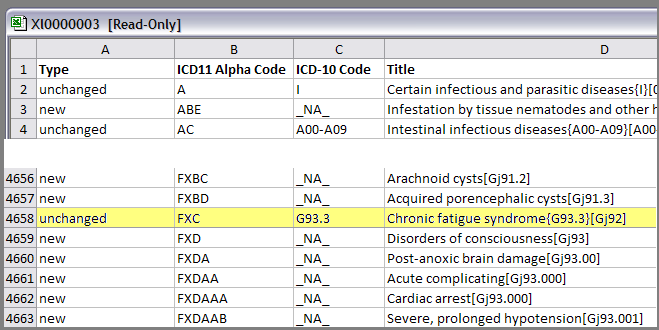 In a forthcoming post, in lieu of an Alpha Draft, I shall be reporting on what can currently be seen in the ICD-11 iCAT drafting platform and associated Revision documents in relation to the three ICD-10 categories: “Postviral fatigue syndrome”, “Chronic fatigue syndrome” and “(Benign) myalgic encephalomyelitis” and why I have asked the Chair of the Topic Advisory Group for Neurology for a clarification. A number of new and existing ICD revision related documents have been published on the ICD-11 Revision Google site in association with the iCamp2 and RSG September meetings. Not all the documents listed have been uploaded to the ICD Revision site and several links are returning “File not found”. Contains Literature search reference at 119 to the Maes and Twisk paper, Treatment of myalgic encephalomyelitis/chronic fatigue syndrome (ME/CFS), a multisystem disease, should target the pathophysiological aberrations (inflammatory and oxidative and nitrosative stress pathways), not the psychosocial “barriers” for a new equilibrium. 2010: Ireland. p. 148-9. Contains Literature search reference at 118 to published response to Maes and Twisk paper by Luyten, P. and B. Van Houdenhove, Treatment of myalgic encephalomyelitis/chronic fatigue syndrome (ME/CFS), a multisystem disease, should target the pathophysiological aberrations (inflammatory and oxidative and nitrosative stress pathways), not the psychosocial “barriers” for a new equilibrium – Response to Maes and Twisk. 2010, ELSEVIER IRELAND LTD, ELSEVIER HOUSE, BROOKVALE PLAZA, EAST PARK SHANNON, CO, CLARE, 00000, IRELAND. p. 147-147.